Recently someone asked "how can I prepare for the upcoming workshop?" This question prompted me to publish here in this blog a section from my upcoming Juicy Creatives Teacher Training Manual. Click the Read More button below to discover ways to "tend your Soul" in the midst of every day life. Sometimes the images you make that you are the most uncomfortable with have the gift you need to see the most! I experienced this phenomenon again, as if for the first time, at an Expressive Arts Conference this weekend. This morning as I was in the shower (the fountain of all good ideas), I was thinking about "Art As Meditation." One of the three key principles of the Source Painting™ workshops I facilitate is that Art can be a practice, much like meditation, that brings us into the present moment and helps us "unhook" from repetitive thought patterns. Click here to see Elise's article on Synchronicity, Shadow and Summer Travel in the SoulCollage® International Newsletter with lots more juicy information and resources from the world-wide SoulCollage® community! I recently headed out on a 7 day shake-down cruise on 27’ sailboat with my boyfriend, his rescue dog Cricket, and a bag of arty accoutrements that included my SoulCollage® deck. We have arrived at the Holidays--the most "glittery" time of year! 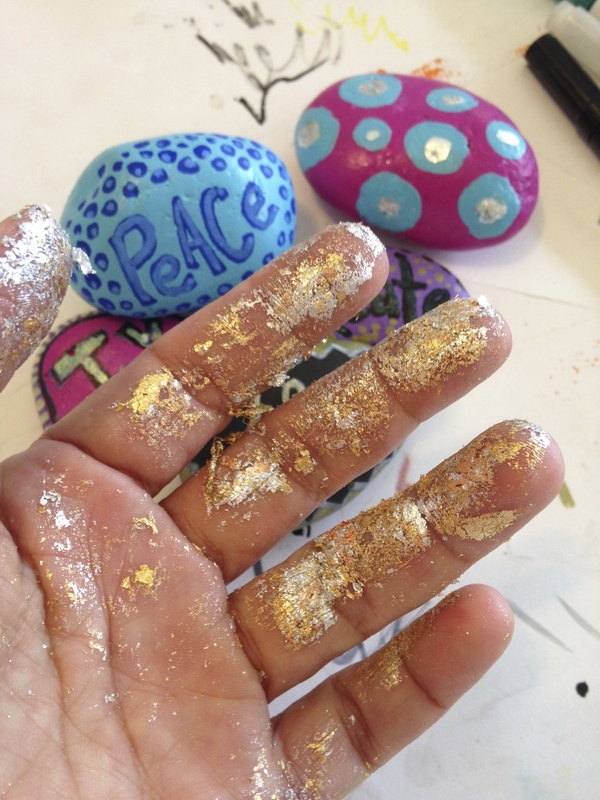 I've been thinking a lot about glitter these days wondering, "what is it that we are reaching for when kids and adults alike spread glitter through their artwork." My conclusion is this: we crave a way to experience and express the NUMINOUS. As a painter, and now a teacher, I see the painting process as a shamanic act. A shaman is a tribal healer whose main duty is not to heal sick individuals within the tribe but to commune with the elements, land and creatures that support the tribe so that “right relationship” is maintained. Right relationship ensures the health of the entire ecosystem. While painting, images and colors come through us, move through our bodies out of our hands into the brush and onto the paper. These images and colors are strange visitors from strange lands – messengers, warriors, and gift givers. Like dreams and shamanic visions they have the capability of returning us and our tribe to “right relationship” among everything we are connected with if we allow their honest expression.